Have you heard of the Coton de Tulear? This happy-go-lucky little dog is slowly but steadily gaining recognition and popularity as a great family pet. The Coton is a small dog that is most likely of French origin, although the breed was once the favored house pet of the elite in Tulear, Madagascar. The breed derives the rest of its name from its mostly white cottony coat. The Coton is still a work in progress, and there are actually four breed standards in circulation with different registry services/clubs. The breed is currently part of the American Kennel Club's Foundation Stock Service, a rare breed registry for dog breeds not yet officially recognized by the AKC, but working toward this goal. 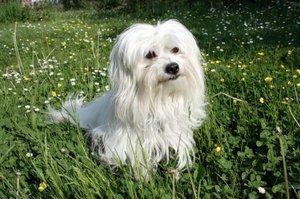 Overall, the Coton de Tulear is a fairly compact little dog, slightly longer than it is tall. The body type is similar to the Bichon Frise. Although it's difficult to tell beneath the hair, the head is somewhat triangular in shape, with a slightly rounded top skull. The teeth should meet in a scissors bite. The tail is carried up over the back when active, and held low when at rest. Because of the aforementioned multiple breed standards, there is some variance in the breed's appearance. The Coton's shaggy coat is one of this dog's most distinguishing features. White is the preferred coat color, although there is often some cream or silver shading on the ears and muzzle. Some dogs are actually black and white.The coat is fairly long and fluffy, and the wavy texture makes it stand out a bit from the body. The coat may catch your attention first, but it's the Coton's personality that really shines. These dogs are happy, affectionate and just a little clownish. They are extremely people oriented, yet they get along quite well with other dogs. Although these dogs are basically eager to please their people, they do think for themselves. This can lead to a bit of stubborn behavior now and then, but overall they are usually cooperative and easily trained. In fact, their energy level and fun-loving ways make these dogs great candidates for agility and fly ball dogs. However, they also do well in obedience trials. Caring for the coat of the Coton presents this breed's greatest challenge. Due to the soft, airy texture of the hair, ideally these dogs must be thoroughly brushed out every day. The coat will mat if brushing is not carried out. This is because the Coton doesn't shed in the usual sense. Loose hairs tend to get caught in the coat and accumulate into mats which must be carefully teased out if you want to preserve the dog's natural look. The breed can be kept in a puppy cut if daily brushing isn't possible. Conversely, bathing is kept to a minimum with this breed. Some breeders recommend that the Coton only be bathed about twice a year, but most owners will find it difficult to stick to this Spartan regimen. Dogs can be spot bathed around the rear quarters to remove any urine stains. The head and face should also receive an occasional bathing to limit staining from food and tears. The Coton's ears should be cleaned out on a regular basis, and the nails should be trimmed as needed to keep the toes from splaying out unnaturally. Unlike so many of today's breeds, the Coton faces no significant health issues at this time. This may change in time as the breed comes to the public's attention and breeding increases. For now, these dogs live as long as 18 years, although 12 to 15 years is the average. Good nutrition, adequate exercise and proper vaccinations will keep your pet in good health.